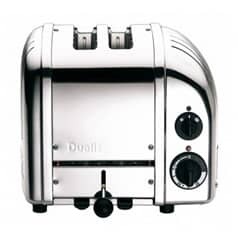 The name Dualit is synonymous with the word toaster - we live and breathe toasting bread. We've got models to suit every need, whether domestic or commercial; for those of you buying for your own home, rest assured that if our toasters can survive the gruelling daily regime of a commercial kitchen, they can certainly perform for you and your family for many years to come. And whilst we're at it.... everyone knows you need tea with toast. Our kettles make great accompaniments! The Dualit brand was established in 1952, by a German-born entrepreneur living in the UK. Founder Max Gort-Barten decided against competing with the rash of kitchenware and homeware manufacturers at the time and instead concentrated on the commercial market. 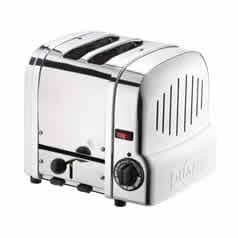 The first product that became popular with consumers was a six-slice toaster; the first of its kind to incorporate an automatic timer. The company experienced expansion and diversification in the 1970s. They hired a Royal College of Art graduate, and retailers like John Lewis began to see the value in commercially designed products for the retail market. By the 1980s, the Dualit brand had become a major household name, and demand for the products meant that the business had to expand its manufacturing plant. Dualit continues to benefit from its introduction of innovative products, and its supply of commercial grade kitchen appliances to the retail market. Today, you can buy high quality, durable, and attractive kettles, toasters, coffee machines, and other kitchen accessories. 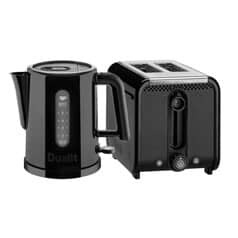 You can also buy Dualit kettle and toaster sets that make it easier to introduce great products into the home. ECookShop has a large selection of kitchenware and homeware items. As well as Dualit products, we have items from Brabantia, Nespresso, and many other manufacturers. We offer free delivery on all orders over �50, and as well as being able to order through our secure online shopping cart, you can also call in to Dawson's Department Store and view our full range, or call and speak to one of our friendly team. Toasters are where Dualit made its name and it remains one of the company's most popular lines. Although the company started manufacturing items for commercial kitchens, today's range incorporates Dualit toasters that toast 2 slices as well as those that toast as many as 4 slices. 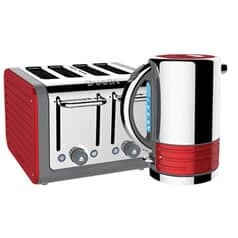 Features do vary according to the model of toaster that you buy, but include individual slice controls so that you only have to use the energy required to toast one or two slices even in a four slice toaster. The defrost setting lets you cook bread directly from frozen, and the proHeat elements ensure that your bread is toasted quickly and evenly. Choose from a range of colours and styles, as well as ensuring that you choose the appropriate size of toaster. The perfect accompaniment to perfectly prepared toast is a cup of tea or coffee, and Dualit kettles offer simple use and effective features. They use high grade materials like stainless steel in some of the models, and hardened plastic in others. There are numerous designs available, including those in bold metallic finishes. And, if you want to get everything you need to prepare the ideal breakfast, then a Dualit toaster and kettle set is the ideal solution. Buying a set means that you can ensure that the design of your kettle and toaster matches, and it also means that you can enjoy the convenience of ordering both items at the same time. When deciding which Dualit kettle is best, consider the volume of water that it will take. Larger kettles are ideal for large families, while smaller kettles are more convenient and typically use less energy for people that do not have the same water heating requirements. 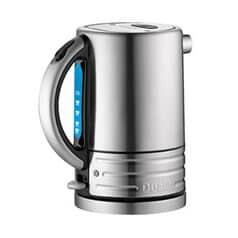 If you prefer coffee to tea, and you like the flavour of freshly brewed, proper coffee, then Dualit can help here too. 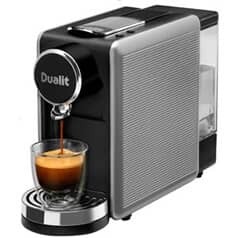 They have everything from coffee grinders to milk frothers, and as well as coffee machines and espresso machines, you can also buy Dualit coffee pod machines. These make it easy to produce great tasting cups of coffee every time you turn them on. The capsules also create less mess, take less time and effort, and they are ideal even for those that have no interest in grinding and tamping. Dualit coffee machines are a great addition to the kitchen, and they also make superb gift ideas for somebody special that enjoys a good cup of proper coffee. You can stock your entire kitchen, including worktops, with Dualit kitchen accessories like the Dualit mixer. 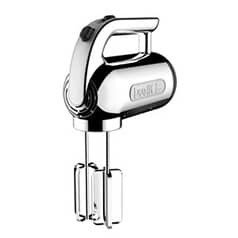 Hand mixers are quick and convenient to use. Juice extractors allow you to make great tasting juice from your favourite fruits, and blenders make it easy to prepare foods and desserts ready for cooking. The Dualit food processor has multiple settings and it allows you to do everything from chop and slice to blend and juice. Because it's a single unit, it means that you don't have to have individual items for every food preparation process, and it makes it easier to stock your kitchen with high quality, durable, and easy to care for appliances. Many of the Dualit products above come in bold colours, as well as traditional and standard colours. Dualit panels enable you to customise the look of your appliances. Add red panels to your kettle, and you can create an entirely new look. It is surprising the impact that the colour of a Dualit kettle and toaster set can have on the d�cor of a kitchen, and because you are buying premium appliances when you buy Dualit products, it makes sense to change the design of the products to match the d�cor of your room. 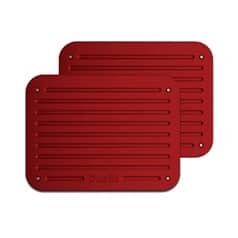 Panels come in packs, and are sold according to the exact make and model of appliance that you want to change, so you can be sure that you are buying panel packs that will fit onto your kitchen appliances. 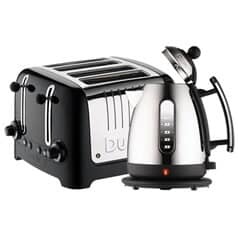 At ECookShop, we have a large selection of Dualit UK appliances and items. 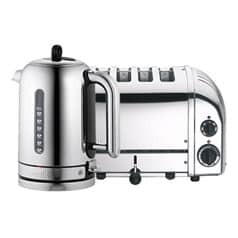 We stock kettle and toaster sets, as well as individual items. We also have a full range of Dualit coffee machines and accessories, and you can buy panel packs from us to customise your kitchenware items. Call one of our team with any questions you have, call in to Dawson's Department Store to see everything we have to offer, or buy from our secure online store. Don't forget, you can benefit from free delivery if your order costs more than �50.